Posted on 12/4/2018, 1:52 pm, by kittykill, under Handmade Gift Ideas, Holidays. Spice up your next holiday party with fun Christmas Crackers. These party favors are not the kind you eat, although they can be a bit salty (WINK!). 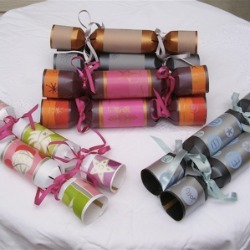 Craftster member elliebelly123 shares her tutorial for Christmas Crackers that can be not used only during the holiday season but anytime you want to have a party. Fill the crackers with little gifts and candy for each guests. Don’t forget to add the traditional paper crown for each person. Not into the party scene? Christmas bon bons are an excellent alternative to bows on presents. No matter what size; small, medium or large, our Handmade Holiday Gift Guide helps you with everyone on your list this season and beyond.